Last holiday season, Kurt bought me all the tools I needed to become a real bread baker. He got me a nice, big, sturdy wooden bread board for kneading, and a DVD that showed me, step by step, how to make bread by hand. At the time, I wasn't a complete stranger to bread baking. 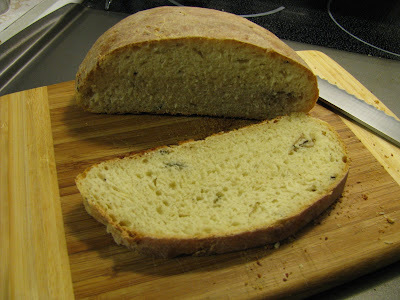 I had made lots of it in my bread machine, and one or two loaves using my Kitchenaid stand mixer. Still, I considered these "cheating," due to all the mechanical help. Over the course of the last year, I have developed somewhat of an obsession with yeast. I've acquired more bread baking books than I care to admit. I've read through recipes, absorbing the process until it is as familiar as my multiplication tables--mix, knead, rise, punch down, shape, rise, bake, cool. I've learned why breads rise, and what is really happening while kneading. I've started to understand the chemistry behind the process. However, throughout all of this, I haven't baked all that much. I have baked a fair number of the breads from Artisan Breads in Five Minutes a Day, and have been happy with the results and fully endorse it to those who want to bake fast, easy, REAL bread. But, for me, it still fell into the "cheating" realm, somehow, because not all the steps were included. Over the course of the last two weeks, I have turned a corner in my bread baking and have somehow become a little less intimidated. Last Sunday, I made Cinnamon Rolls from The Bread Baker's Apprentice. They came out very well. I was bolstered. I made the Chocolate Swirl Wreath from my last post. It turned out very well. So, I continued. On Friday, I started a seed culture for a sourdough starter. It's on day three now, and has risen significantly. I can't wait to start baking with a real sourdough starter. And today, I made the Potato Rosemary Bread from The Bread Baker's Apprentice. 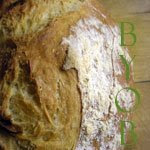 Actually, I started this bread on Friday, by making the biga. Today, I finished it. This bread was a long, involved process. I started first thing this morning, by setting a head of garlic in the oven to roast for an hour. At this time, I took the biga out of the fridge, to take the chill off. In the meantime, I made a dozen Ginger Rum Muffins from Granny's Muffin House for breakfast. Then, I boiled the potatoes to make the mashed potatoes. By the time the garlic was done roasting, the potatoes were ready for mashing. Kurt was busy getting himself on Facebook (finally), so I let the Kitchenaid do the kneading, so that I didn't have to move Kurt in favor of my bread board. This dough rose nicely, and was ready to be shaped after the two hours expected. The boules doubled in size after about an hour and a quarter. Then, I baked them. The smell alone was worth making this bread. The roasted garlic and rosemary blended together to make my house smell amazing. The taste even surpassed the smell, though. The crumb is tender, the crust crunchy. The roasted garlic and rosemary meld with a hint of potato, and some bite from the ground pepper. Paired with a slice of aged cheddar, this bread is pure enjoyment. I am probably inordinately proud of this bread. With the biga, and all of the prep work, I finally feel like this is the real thing--even if I did let the Kitchenaid knead it. I will definitely make this one again.